Whether or not you believe in the paranormal, the fact remains that horror is not simply limited to fiction. The debate over whether or not ghosts do exist is one that’s been argued for centuries. However, what is not up for debate is the existence of ghost towns. Perhaps you’ve seen coverage of this matter in a movie. Think Silent Hill for a popular example. But ghost towns don’t just exist in the movies. They are very real. And, ironically, considering the name, they tend to draw quite a large amount of lively tourism to them. Have you ever wondered how many ghost towns there are, dotted throughout our world of the living? Perhaps you’ve even heard of some, like Hashima Island in Japan, or Oradour-sur-Glane in France. Or, perhaps you’ve heard of the one I intend to cover today: Pripyat. For those of you that aren’t familiar with the Chernobyl Disaster, this is the breakdown: On the morning of April 26th, 1986, in Pripyat, Ukraine there was a power surge in the fourth reactor of the Chernobyl power plant. It triggered a chain reaction that ultimately led to a catastrophic nuclear disaster. Prior to this event, Pripyat, the city most directly affected by the accident, held a population of approximately 14,000 people. After the disaster, it held 0. But the thing that makes Pripyat so fascinating is the tourism that it attracts. The reasons for the abandonment of all ghost towns in this world vary greatly, but Pripyat’s is still relevant, even now, some thirty years later. It remains to this day extremely radioactive, and experts predict that it will remain that way for hundreds of years still to come due to health risks posed from the radiation. The include various kinds of cancer, deformations, and acute radiation syndrome. In fact, many people who evacuated Pripyat in the early days following the accident developed cancer and subsequently died from it. Despite this level of danger, Pripyat has attracted countless tourists from all over the world. Evidently radiation has died down just enough to allow tours through parts of the city, but if you ask me it’s still a very calculated risk by all those that enter. After all, every person that goes into Pripyat on a tour must be cleared by a radiation detection machine before leaving. How inviting! But I can understand the fascination that ghost towns such as this generate. Maybe it’s a side effect of being a writer, this unrelenting curiosity, but it’s astounding to me that a place which was once so thriving and grandiose could turn into something so haunting and left-behind. Pripyat in particular looks and feels like a place completely frozen in time. 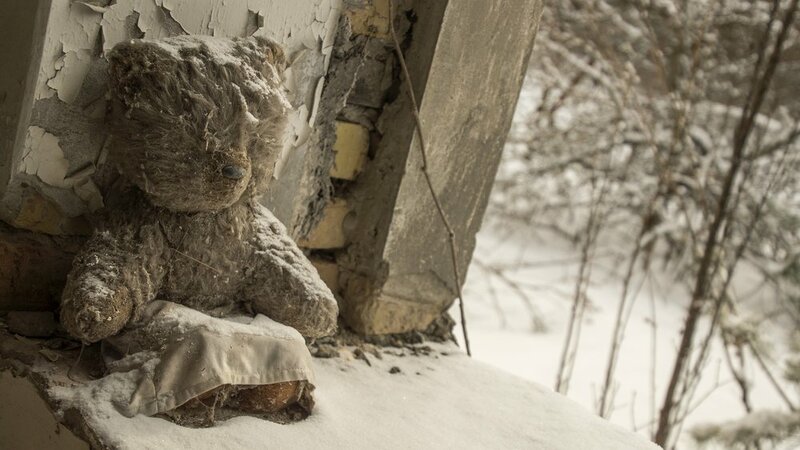 There are pictures of dolls and teddy bears left behind, old classrooms and nurseries completely as they were, but with a thick layer of dust and decay covering them now. There is even a ferris wheel that was new and completely unused at the time of the evacuation that stands in this vacant world inhabited by nothing but radiation, dust and debris, and perhaps the occasional animal. But when I really get thinking, I have to wonder if the radiation is truly the only thing that haunts the city. I’m not saying outright that Pripyat is a town full of ghosts. But I have a hard time believing that a town that was abandoned so quickly and so entirely by all its living inhabitants wasn’t taken back over by inhabitants of a different kind. For a more detailed guide on the requirements of touring Pripyat, please refer to this blog written by Stephanie Craig, a woman who participated in a tour group through the city herself.